Another year, another birthday... Heck, I think I've stopped counting. To me, I'm forever stuck at 25 years old. On the other hand, Viv believes I stopped at 20. I guess I can't argue that as I'm doing the same things now as when I was 20. Well, except for the red blazer and big hair... So we ended up doing what we usually do when I grow older - we go eat! 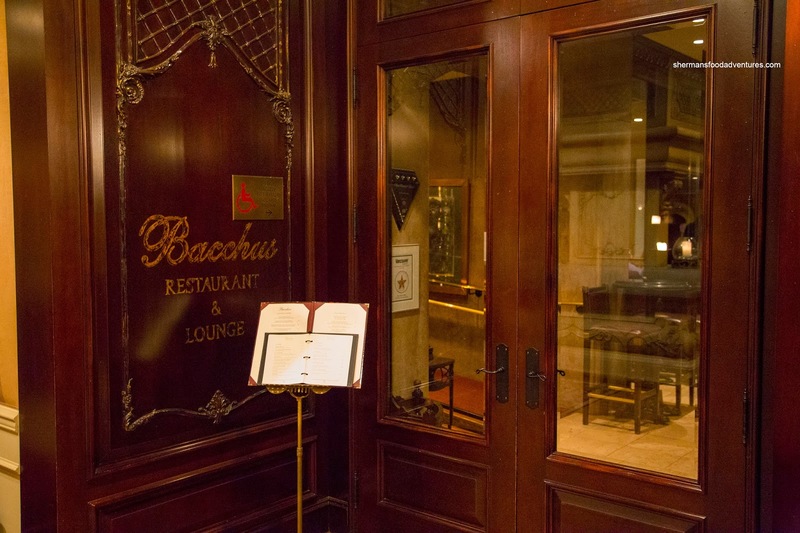 This time, I decided on Bacchus Restaurant and Lounge since I have yet to eat there, but have had the pleasure of dining on Chef Lee Parson's creations at an Edible Canada in the Market Dinner in the past. 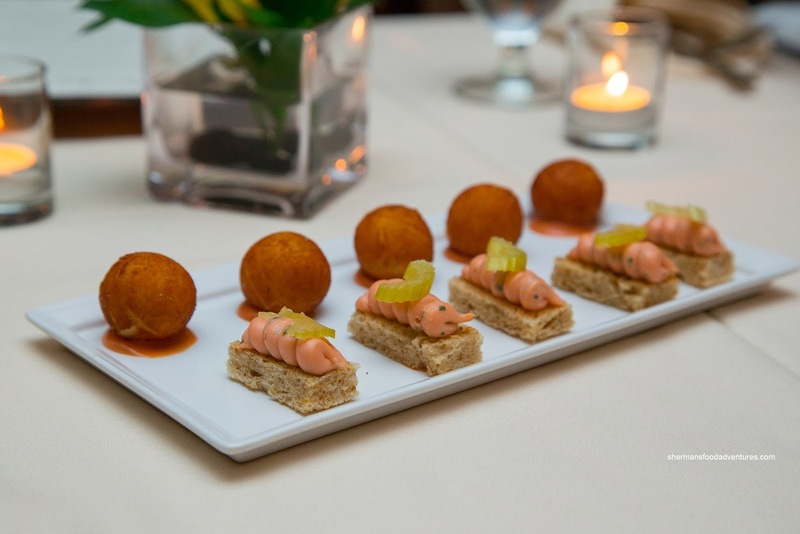 We began the meal with a plate of Amuse Bouche that included potato croquettes and smoked salmon mousse. The croquettes were simple, yet executed nicely being lightly crisp on the outside while airy on the inside. The nice hit of truffle oil didn't hurt either. As for the salmon mousse, it was smooth and creamy with a nice crunch from the celery. 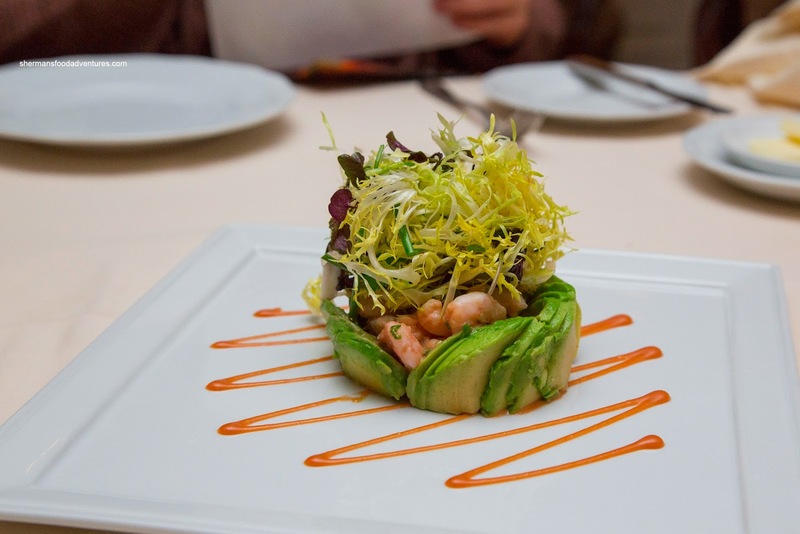 Our first appie to arrive was the Avocado & Hand Peeled Shrimp Salad with blush aioli and fine herb salad. The ample amount of shrimp were sweet and dressed in a plenty of creamy aioli. With an acidic vinaigrette, the frisee on top was a welcomed change of pace. 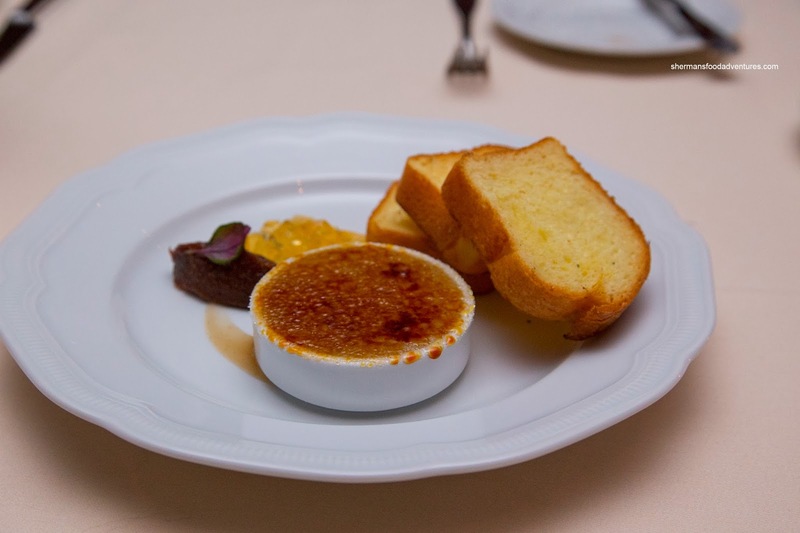 Decadent and rich, the Chicken Liver and Cognac Brulee was accompanied by Okanagan fig chutney and toasted thyme brioche. The chicken liver was smooth and sweet accented by a balanced amount of salt. However, the sweetness was amped by the torched sugar on top. Although the brioche was a tad dry, it only served as a blank canvas for the chicken liver and cognac gelee. When mixed with the fig chutney, the array of flavours were pleasant. 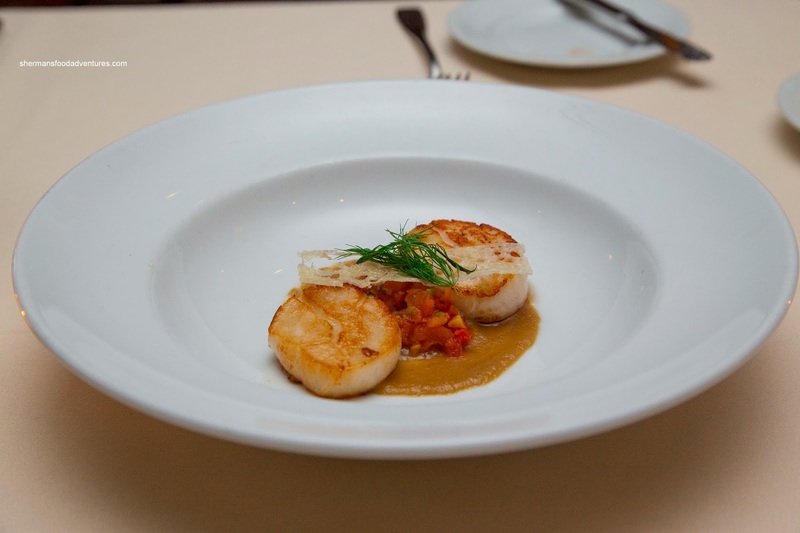 Our last appie was the Pan Seared Alaskan Scallops with fennel and cardamom puree, cured tomato compote, castelvetrano olives and cold pressed olive oil. The lightly seared scallops were sweet while being a touch too firm. 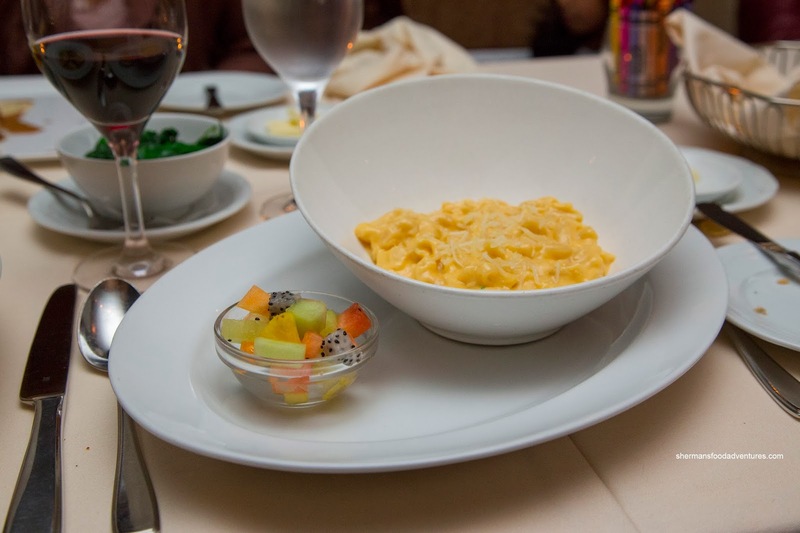 The natural flavours were highlighted with acidity from the compote and mild aromatics from the puree. 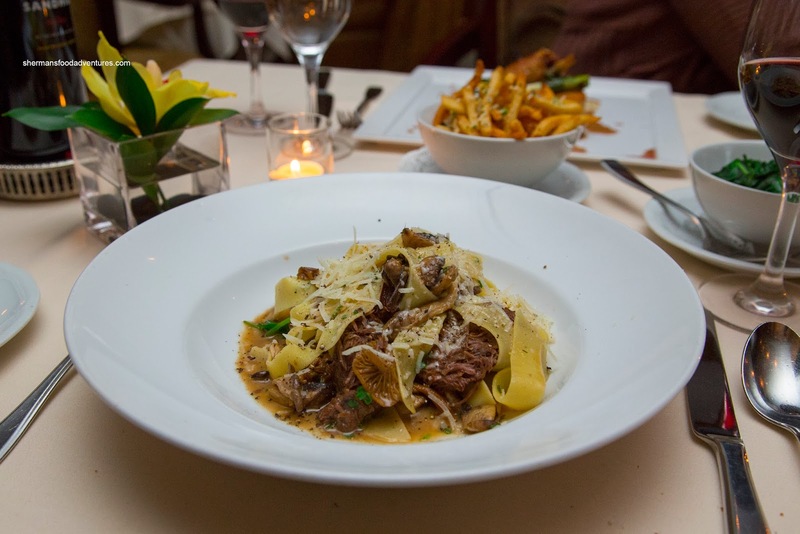 Moving onto the mains, I decided on the Pappardelle Pasta with pulled slow braised short ribs, chanterelles and organic kale. They really should've renamed this short ribs with some al dente pasta as it was packed with meat. It was sufficiently tender and its natural flavours helped season the dish with a meaty depth. The chanterelles were really apparent with each bite. My dad went for his standby being the Wild BC Salmon with Swiss chard, glazed salsify, raisins and caper dressing. Being a fairly simple dish, the execution of the salmon was paramount. 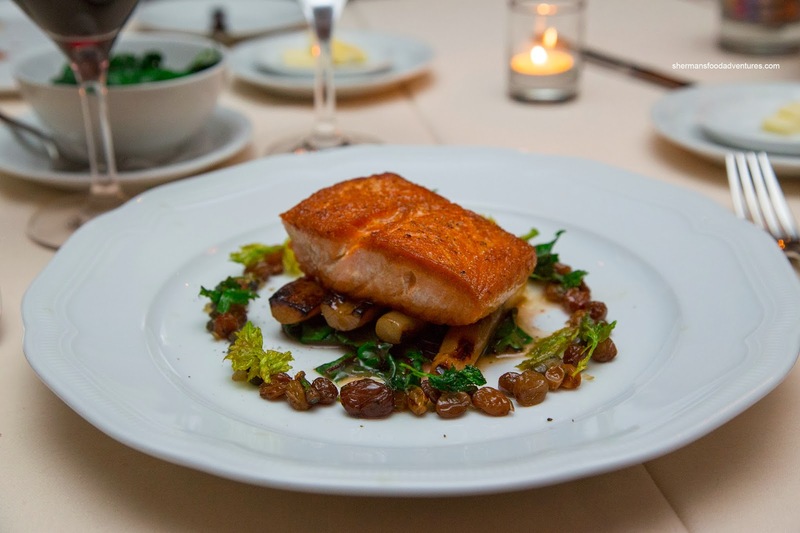 In that respect, they nailed it since the salmon was moist with a beautiful crispy sear. It was mildly seasoned which allowed the sweet, plump raisins do their thing as well as the caper dressing. I thought the use of salsify as a good compliment to the salmon. 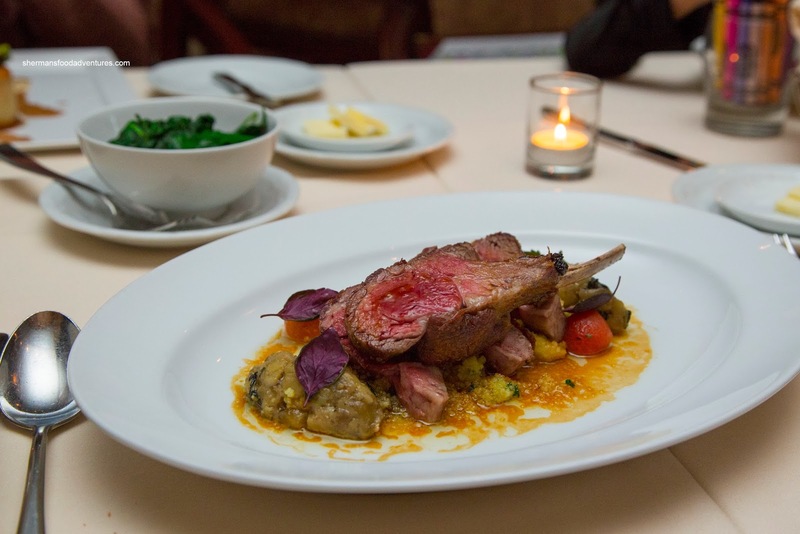 My mom, who probably loves lamb more than than myself, predictably had the Roasted Rack of Lamb with saffron couscous, eggplant compote, cured tomatoes and simple lamb jus. As evidenced in the picture, the lamb was on the rare side, but for me, it was fine. It was moist and tender with a mild gaminess. Again, the natural flavours did the talking as it wasn't over-seasoned. With all the wet ingredients and jus, the couscous became saturated though. 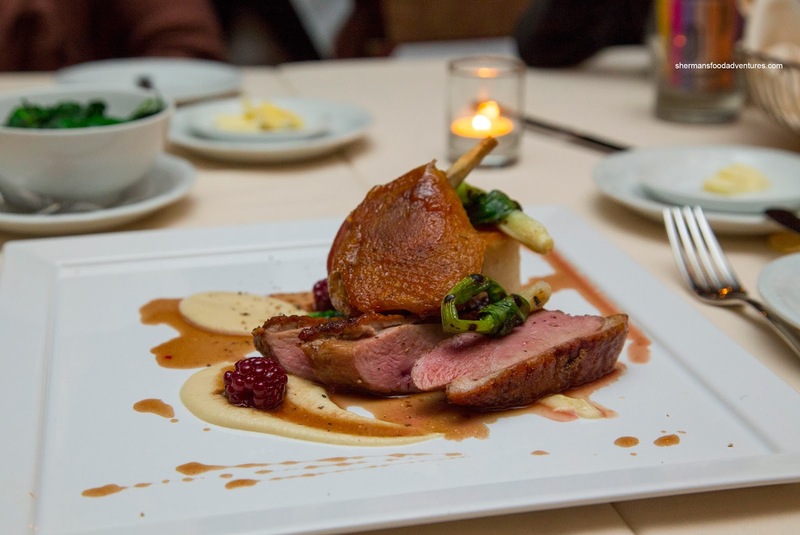 Viv opted for the Duo of Brome Lake Duck consisting of roasted breast, braised leg, sautéed spinach and blackberry sauce. The duck leg confit was super tender with rendered and crispy skin. It was again natural tasting without the aid of too much salt. As for the breast, it was buttery soft with properly crisped skin. The blackberry sauce was a good match for the duck with a mild sweetness, but the dish could've used much more of it. 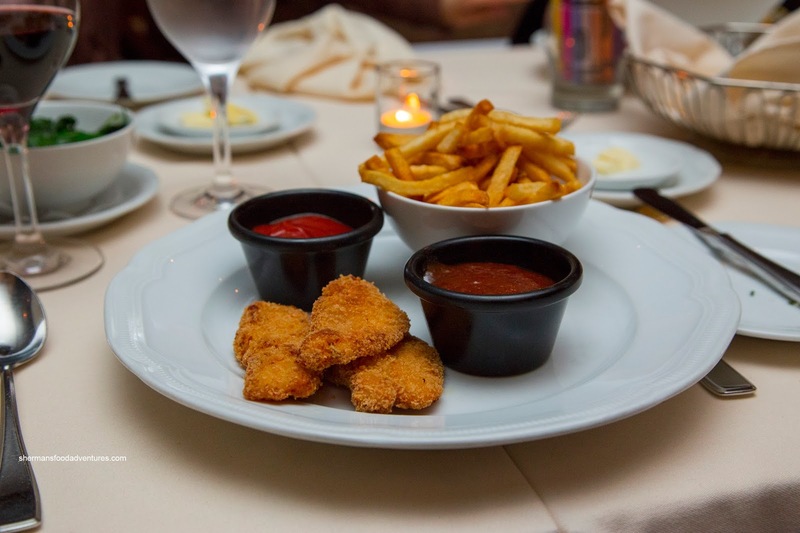 Despite being a classy establishment, Bacchus offers up a kids menu much to our convenience. Therefore, my daughter chose the Mac n' Cheese and my son had the Chicken Strips. I stole some of the mac n' cheese (to my daughter's chagrin) and it was pretty thick and creamy. She really liked the cute side of fruit salad. As for the chicken strips, well, they were chicken strips. They were crispy though with moist white meat. The fries were crispy as well, but nothing out-of-the-ordinary. 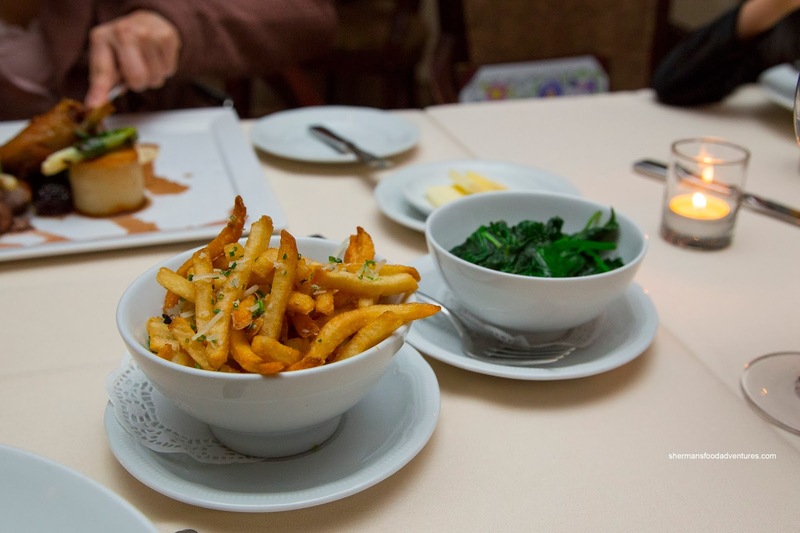 On that note, the side of Truffle Frites were quite tasty (plenty of truffle oil), but the frites themselves could've been crispier (maybe double-fry them?). We also got a side of Sauteed Spinach with Lemon & Garlic which was pretty good. It was just wilted with a nice hit of acidity. For dessert, we shared a platter consisting of a Piquant Lemon & Lime Tart with raspberry sorbet and a Vanilla Bean Creme Brulee with bitter chocolate cookies. One bite into the tart and wow, there was a immediate hit of sour. Luckily there was ample sugar to keep it somewhat in check. I loved the texture though as it was just dense enough with a firm crust. The sorbet was excellent though with a refreshing fruitiness. 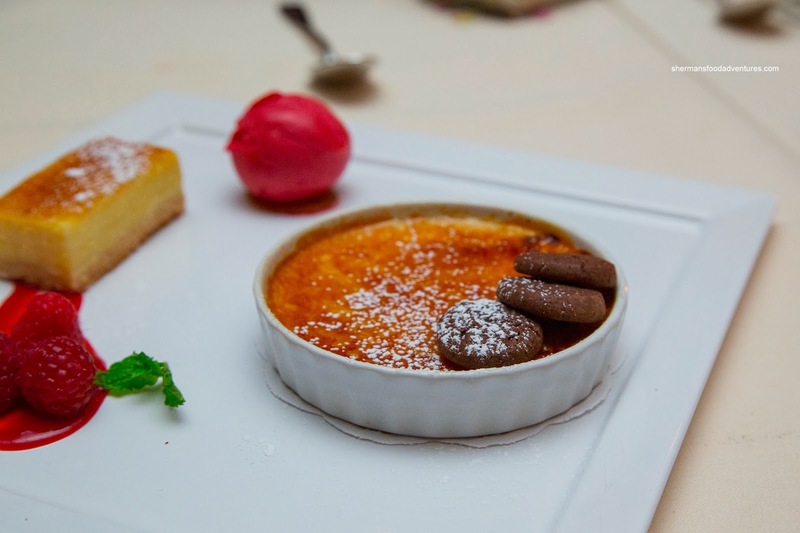 As for the creme brulee, it was a pretty classic interpretation with a smooth silky custard that was pretty sweet. 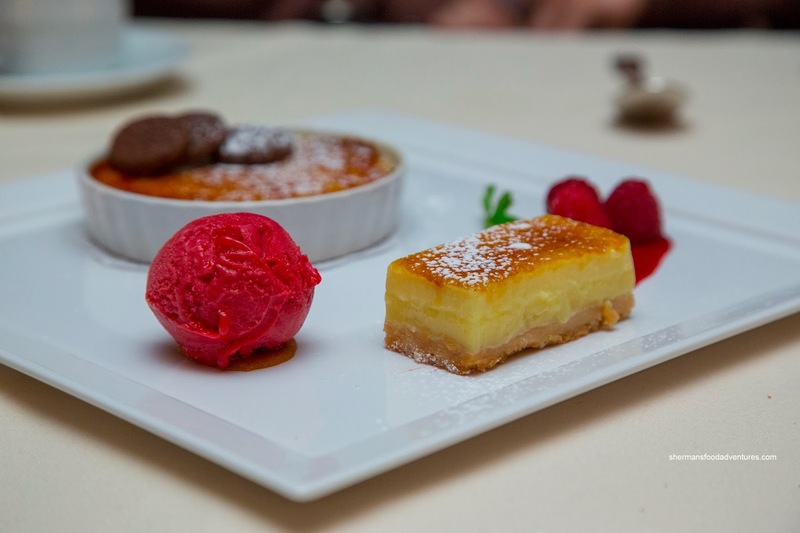 The torched sugar was thin and hard which added even more sweetness. This was a fine way of ending what was a good meal. Proteins were mainly on point where the chef let the natural flavours shine. Loved the availability of a children's menu too. The Spud Shack Fry Co.